Certified Organic, Bragg Organic Extra Virgin Olive Oil is made from 100% organically grown Olives that continually provide the best quality and flavour. 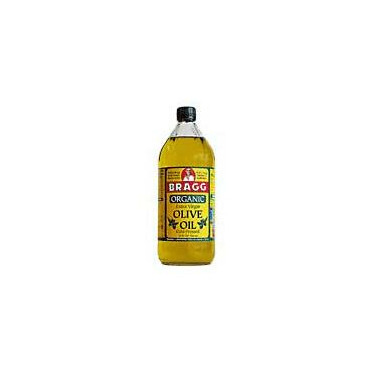 Bragg Organic Extra Virgin Olive Oil has a delicious, smooth body with a light aftertaste. It adds the finest flavour and aroma to salads, vegetables, pastas, pestos, sauces, sautés, potatoes and most foods – even popcorn. In 400 B.C. Hippocrates, the Father of Medicine, used and wrote about the great benefits of olive oil. Ingredients: 100% Organic, Extra Virgin, Unrefined, First Cold-Pressed Olive Oil. This is a lovely tasting olive oil and it's the only oil I buy. My go to olive oil!! I love Bragg products. I use this oil for salads. It has a great taste. This oil comes from the first pressing of the olives (which is the best oil). It goes straight from the olive to the bottle. It has a medium olive flavor, not too strong, but not too light either (like the ones you buy at the grocery store). It's quite cloudy because they don't filter it (Some of you may not like this), and, of course, it's organic.. This olive oil is best dribbled on a great salad or a fine Mediterranean dish But then, I've cooked with it too, although it gives the food a very faint olive taste. Overall, a great olive oil. Nice product - just would prefer if it was in a dark bottle to protect the oil. I have been looking for a quality olive oil that won't break the bank and I found it here - love Bragg products. Arrived with other bottled items with no damage - very happy with the product and service. Will purchase here again.